What Day Of The Week Is November 1? 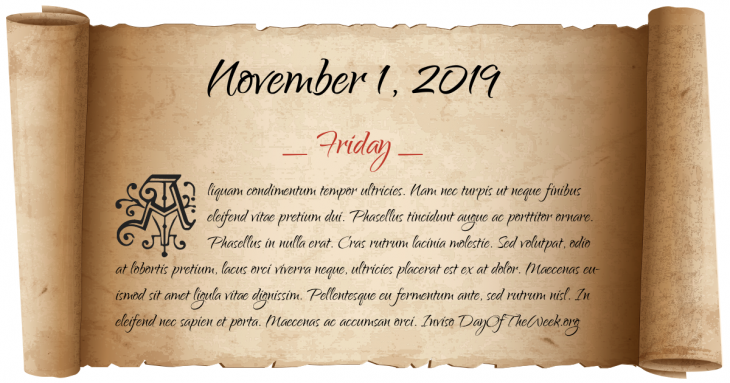 November 1, 2019 is the 305th day of the year 2019 in the Gregorian calendar. There are 60 days remaining until the end of the year. The day of the week is Friday. The British crown colony of New York is subdivided into 12 counties. US President John Adams becomes the first President of the United States to live in the Executive Mansion (later renamed the White House). In the United States, the Weather Bureau (later renamed the National Weather Service) makes its first official meteorological forecast. Paul Miliukov delivers in the State Duma the famous “stupidity or treason” speech, precipitating the downfall of the Boris Stürmer government. American photographer Ansel Adams takes a picture of a moonrise over the town of Hernandez, New Mexico that would become one of the most famous images in the history of photography. World War II: In support of the landings on Bougainville, U.S. aircraft carrier forces attack the huge Japanese base at Rabaul. Operation Buster-Jangle: 6,500 American soldiers are exposed to ‘Desert Rock’atomic explosions for training purposes in Nevada. Participation is not voluntary. The Mackinac Bridge, the world’s longest suspension bridge between anchorages at the time, opens to traffic connecting Michigan’s upper and lower peninsulas. The New Orleans Saints football team is founded. Who were born on November 1?